In 2018, Riot Games prioritized champion reworks over new champion developments with many older champions like Urgot, Aatrox and Irelia getting well-deserved overhauls. Unlike other years, Riot has only introduced two new champions to Summoner’s Rift with a third hitting the live servers as we speak. Riot’s first shape-shifting chameleon and ‘Color Mage’ from Runeterra has the ability to take the form of other champions on her side, which is definitely going to introduce an additional comical aspect to the game. With this in mind, welcome to a Mobalytics champion guide for Neeko, by PicklePants. Before we begin, you may want to familiarize yourself with Neeko’s kit. We’ve all been deceived by a Shaco or LeBlanc clone…Neeko takes the gameplay aspect and injects it with steroids. Love it or hate it, the art of deception is strong with this one and it will take a lot of time getting used to. If you don’t already know what her abilities do, we’ve got you covered with a few tips. Neeko can steal the appearance of an allied champion and maintain it until she casts a spell, deals damage to a champion, or takes damage from a champion. When you’re taking a disguised form, you will have access to all cosmetic features of a champion, ranging from their emotes to looking like you have the same buffs (if they have Blue buff you will have it circling you but not Blue buff’s effects. You can use their auto-attack animations to hit minions and monsters but you will not adapt their damage or attributes such as increased range (Kindred/Tristana) or on-hit effects (like Teemo’s poison). Tip: Try to be as discreet as possible when taking the identity of another champion. The best time to transform is when you and the ally you’re copying are out of sight to maximize enemy confusion. Neeko throws a seed into a location that detonates shortly after. If the blast hits an enemy champion, large monster, or kills a minion, the seed will detonate again. This can happen no more than up to two times (three total hits). Tip: Your Q inflicts incredible burst if you can detonate it more than once. If you can be patient and wait until you or your allies use CC, you can get much more value for your mana in lane and make a bigger impact in teamfights. Passive: Every 3rd basic attack grants Neeko extra damage and a brief movement speed bonus. Active: Neeko becomes invisible while sending out a clone in a target direction. If she has taken the form of another champion, the clone will be her current disguise. While in use, both the clone and the real Neeko gain bonus movement speed. Tip: W can be used offensively or defensively! You can juke, and turn around a fight by making your clone walk one way while you stand still and fight back. Or, you can use it to reposition for extra damage and secure a kill. Neeko throws out a root that locks the enemy in place for a small amount of time. If the root makes its way through 2 other enemies (champions, monsters, or minions), it will become empowered and root the final enemy for a longer duration. Tip: In lane, try to use your E through the minion wave for additional root duration. In teamfights and skirmishes, look to weave your E through the front-liners and peelers so that the final hit is on a carry (to hold them in place for the longer duration). This may be able to singlehandedly win the fight, especially if you follow up with your ultimate. Neeko charges a spiritual essence around her. While charging, she gains a shield which increases depending on how many enemy champions are within the radius. Once fully charged, she will leap into the air and stun any champions who remain inside. If she has taken the disguise of another champion, her Ultimate charge will be invisible to the enemy. Tip: Your Ultimate can be easily dodged if you’re charging it in the view of the enemy. During the laning phase, the best way to use it would be from a bush or out of sight of the enemy and then ambush them with it. Neeko is one of those champions that fits well into any team composition which makes her perfect for Solo Queue. She is a jack-of-all-trades champion that is able to do a lot of things with her kit – she can poke, deal AoE damage, kite, skirmish, hmm…what can’t she do? While she will work with basically anyone, there are some team compositions and favorable champions that can enable her. Neeko is able to move around the map with ease. She is in some respects, a roaming goddess if she is enabled correctly. This is why it can be beneficial to have lanes with strong and reliable CC. Remember that your Q’s potential is determined by how long your enemy stays within its radius if you’re able to double CC chain the enemy champs like Malphite Top, Malzahar (Mid), or Ashe (bot) to basically guarantee a kill. Have you seen how big Neeko’s ult range is? Neeko can be slotted in perfectly in any wombo combo team comp because she has one of those ults that can lock down and blow up people. Pair her with champs like Amumu, Jarvan IV, or Ornn, to allow easily follow up for your Pop Blossom. With Riot gradually reducing the amount of vision control in the game, (most recently lowering the Control Ward limit from 3 to 2), Mid game fights and skirmishes have become more impactful. Skirmishes are the messy, unorganized battles – think 3v3’s, 4v4’s, with a lot of incomplete information. Neeko thrives in team comps that look to skirmish because of her ability to create chaos. When a fight is happening in multiple directions, even the slightest hesitation due to one of your clones can create a fatal disadvantage for your opponent. It’s not quite clear yet where Neeko will be played and our in-house experts predict she will be either played in the Mid, Support, or possibly Jungle role. This wouldn’t be the first nor the last time that a champion can be played in multiple roles like Vayne or Camille. Riot’s lead developer Riot Scruffy has hinted that she will be played mostly Mid or Support. Since I’m a Support main, I’ll be focusing on ADCs that would pair well with Support Neeko. 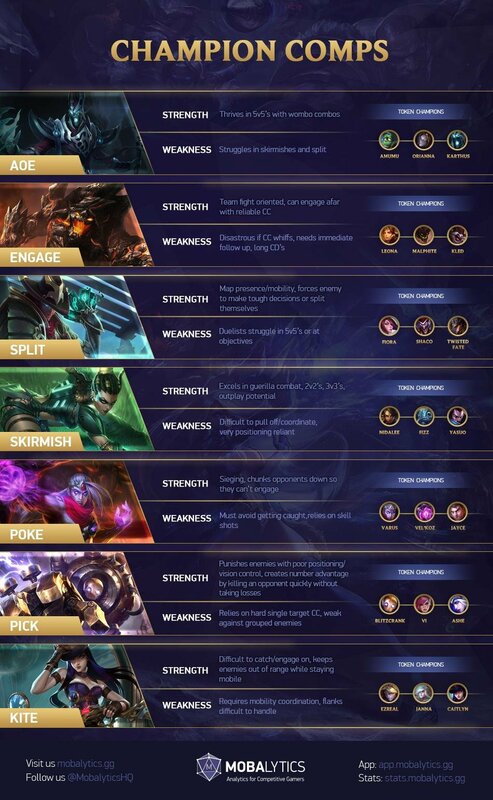 We’ll explain the reasoning behind why each is good and you can apply the concepts to other lanes and champions. Miss Fortune will benefit from Neeko’s kit as she will be able to line up her Q consistently when Neeko land’s her E, and MF returns the favor because she can slow with her E to allow Neeko’s Q to bounce more consistently.When level 6 arrives, Neeko and MF will have their own potent wombo combo that can often yield a Double Kill if the enemy duo isn’t ready for it. Lucian is one of the best skirmishing marksmen so it’s no surprise he works well with Neeko. His incredible level 2 is greatly enhanced by champions with CC. If this duo hits level 2 before the enemy, Neeko can line up her crowd control onto one of the enemies and Lucian can burst them down with the follow-up. Rinse and repeat to establish early dominance. As the match goes on, the two champs can weave in and out of battle, making it hard for opponents to lock them down. Ezreal is a poke champion that synergizes well with Neeko as you can both continually poke and dish out damage with your abilities. With Ezreal’s recent rework, he has also become rather good at following up with the Support. Look to burn down your foes from afar, you’ll likely be able to force them out of lane. If they play their luck and greed for extra CS when they’re health is low, look to finish them off with an all-in if you land a bind, especially if you have your ultimates ready. Draven players love champs that can make their job easier, either by softening up targets with poke or by holding them in place to line up axe throws. Unlike some other Supports, Neeko’s CC goes through minions which makes it tricky to dodge. Opponents will have to worry about simultaneously dodging axes and Tangle-Barbs. Jhin excels when laning with a Support who has the ability to lock people in place. He can also provide his own variety of roots and slows from his own kit. The two together go hand in hand as they can deal a lot of damage if they’re well coordinated. Jhin’s ultimate can draw enough enemy attention for Neeko to sneak in and land an optimal ultimate of her own as a follow-up. Luden’s Echo is rather popular in the current meta and is a necessity for many AP champions. Neeko will benefit from this item heavily, as it gives her a range of stats and effects that synergize with her playstyle. The bonus mana and cooldown reduction, for example, will increase the amount of damage she deals by enabling her to use her abilities more often. As we mentioned earlier, Neeko thrives in skirmishes so having more mana and CDR means you’re casting spells for a longer time and more often. Since Neeko can pretend to be melee champions, situationally you may sometimes find yourself up close and personal with your foes. The extra survivability can go a long way and you’re still getting a decent amount of AP to maintain a threat. However, the main draw for this item is that it greatly improves your ability to get in the thick of things and engage because you can use it during your ultimate animation. It works similarly to Morgana’s Flash + R + Zhonya’s combo, try it out and get the timing down in the Practice Tool before busting it out on the Rift. This is another great item for Neeko for a number of reasons. First off, you get those juicy skirmisher stats with CDR and movement speed. Second, you have the active ability, which is, of course, the infamous spooky ghosts. The spooky ghosts can be Neeko’s best friend as she roams to other lanes. You can send a clone of an ally in one direction to force your enemy one way and then send out the ghosts to catch them for the follow-up. They’re great for setting up your roots and ultimate, and can hunt down your prey as they try to escape. It’s only been a few days since her release, so there is still much more to be discovered. Here are some of her bread and butter combos that you should become familiar with to maximize your impact with her kit. Your Q can deal extra damage if you land it on an enemy champion. If you can hit the enemy with it and then follow up immediately with your E to root them, it will keep them in place while your Q continues to detonate and deal more damage to the enemy. Like the previous combo, if you can land your E on the enemy, you can use your Q afterwards to deal follow up damage. As your E isn’t going to always root the enemy instantly, using your Q like this may allow for multiple detonations. Depending on how far away the enemy is, you may find more success with this combo. This combo specifically utilizes Neeko’s W. When using her W, you want to make sure that you can surprise the enemy and not let them know which one is the real you. When ganking, roaming or fighting the enemy, this may be difficult though- so you’ll need a lot of practice. The best time to use this combo would be when you’ve set eyes on the enemy straight from a bush or the river. Another prime example would be if you’re trying to turn around a fight. The issue with Neeko’s ultimate is that it does have quite a long charge time. Ideally, you would want to use her Ultimate to either start a fight or finish it. It may be difficult for you to use your Ultimate mid fight because you are held into a position which may give the enemy a chance to react to escape or kill you. This is why it is fantastic to hit a root prior to using your Ultimate. If you have taken the form of another champion, you’ll be able to cast your Ultimate when disguised. Using your W to get into position and then casting your Ultimate almost immediately will allow you to have a higher success rate when using it. This specific combo – IE when you use your Ultimate near the start, relies heavily on your team to stun or keep the enemy in place. We mentioned this earlier in the items section, but if you missed it, this is one that you’re going to want to get used to. Casting Zhonya’s won’t cancel your ultimate animation so you can be in stasis while it goes off. If it’s safe you can follow this combo up with a Q + E or an E + Q.
Mastering a champion immediately is near impossible. It takes a lot of time, dedication and practice before you can get the hang of a champion and build proficiency. Neeko seems to be one of those weird champions that take a lot of practice to fully utilize their kit. With that said, here are some tips and tricks that we’ve learned so far. Transform into an engager on your team and make them second guess which of the three Malphites are going to ult them. Remember that you can change forms immediately after W’ing so you can send out one allied clone out of a bush, and then come out another side as a completely different ally. Neeko’s kit relies on surprising the enemy. If they see what you’re doing, they will not fool for your bait. This means that any use of your Passive or Ultimate in the early game should be done out of sight of the enemy. Neeko’s W is a core component of her kit and playstyle, so know it well. It has a ton of utility when used correctly, here are some quick tips regarding it. The clones grant vision, use it instead of face-checking when you can. You cannot use your W to dash over or through a wall. There is a short delay before the clone appears so although you can block skillshots with it, you’ll have to time it a bit preemptively. Play around and test different interactions – for example, you cannot blast cone your clone over a wall like you can with Heimerdinger’s turrets. Hitting level 2 first is important in every lane but Neeko is one of those champs who can successfully all-in for a kill. If you can use your E+Q on the enemy, you will notice that you do a lot of damage in the early level exchanges. Mix this in with Ignite and the enemy is in for a rough early game. If you are going for 45% CDR too – your ultimate will be on a CD of just under 50 seconds. This is insanely low for such a game-changing ultimate so try to be in a position to use it whenever it’s about to come up. We’re happy to see Riot release another interesting champion to the game, it’s always fun when new mechanics change the way the game is played. As of yet, we’re still unsure where she will be played optimally in terms of role, but I expect she will be in the bottom lane at 5 minutes like every other champion…(sigh, just kidding). We hope that we’ve given you the basics of learning and understanding Riots latest creation – Neeko! Thanks for reading! 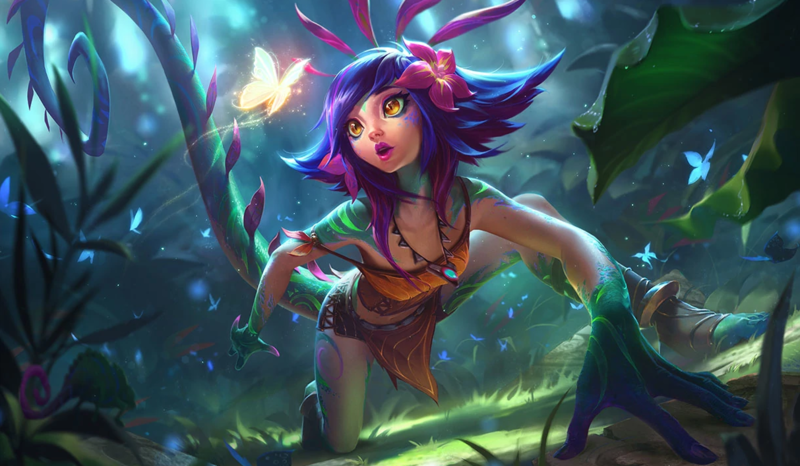 Let us know what you think of Neeko and tell us if you have some tips and tricks of your own that we missed. As always, you can find Picklepants in our Discord if you have any questions.